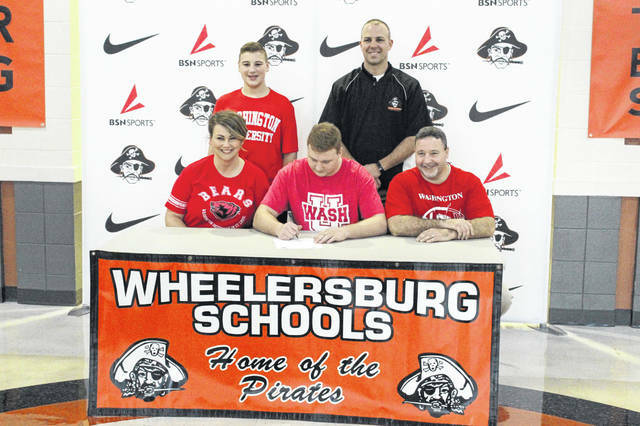 Dahm signs LOI with Washingtion U.
WHEELERSBURG – Making dreams become a reality, that’s what signing days are all about. The amount of hard work and effort it takes to receive a scholarship, whether academic or athletic, or both, is immeasurable. After signing with Washington University in St. Louis, that’s the feeling that Wheelersburg senior Evan Dahm felt at his signing ceremony at Wheelersburg High School Tuesday afternoon. Because of Dahm’s personal connections to the St. Louis area, he felt as if Washington University would be the perfect place for continuing what he’s worked his whole life to achieve. Dahm says that after speaking with the coaches at Washington U., they plan to continue playing him at the linebacker position where he starred for the Pirates. Dahm helped Wheelersburg reach the state semifinals for the third time in his four years, helping amass a 52-4 record for himself and his fellow group of seniors during that four year period. Personally, Dahm had an incredible senior campaign. The linebacker led the Pirates with 63 total tackles (46 solo, 17 assisted) and 2 pass deflections through the regular season. By the end of week fourteen, the final week of the Pirates season, Dahm had a total of 109 tackles (74 solo, 35 assisted) to lead his team in both categories. Dahm says he plans on majoring in chemical engineering once he enrolls at Washington University in the fall of 2019, and once that’s over, he hopes to begin a career doing the one thing that he says has had an incredible influence on his life.